Frieze: What Can We Learn From Water? : A Report from Colomboscope — WorksOnWater Works On Water Blog Blog focused on artists who examine, move over, look at, work with, journey on, use metaphorically, or create new connections to water, rivers, lakes, oceans, or boats. A review in Frieze by Himali Singh Soin. By the time I arrived at ‘Sea Change’, the sixth iteration of Colomboscope arts festival, I had already spent a fortnight travelling through Sri Lanka. The sway of the palms had entered me; island time swirled around my ankles. 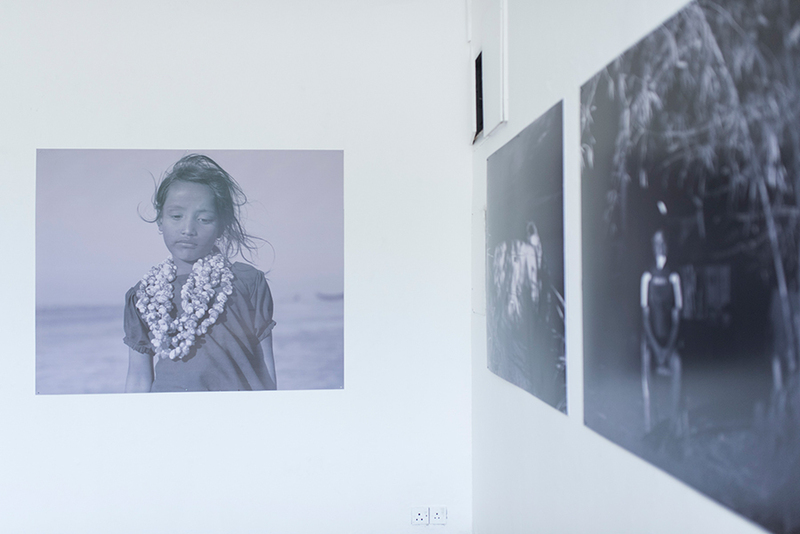 I made my way to Barefoot Gallery, where Bangladeshi photographer Shadman Shahid’s unframed, black and white series ‘Another Day in Paradise’ (2016) provided a stark contrast to both my mood and the up-tempo jazz playing in a cafe outside. These works grasp at a dark, deep, complex melancholy. A man sits on a plastic chair on a beach in fins, a mask and a snorkel tube. He looks downwards, as if to the depths of the ocean floor. In another photograph, a man sits in a kurta and a sarong with a falcon on his shoulder. A turtle is washed up on shore, its shell cracked. A little girl lies asleep, mermaid-like, on a rock near the water, draped in silks. Light stems from unexplained sources and darkness reveals loss. Ecological catastrophe is in close proximity to the occult. Multiple systems of knowledge make up this fragile ecosystem. ‘Sea Change’ emerges as a festival asking some of the most pressing questions in the region: about migration and gentrification, climate change, the future of labour in the wake of automation. There was an abiding sense that the festival will continue to push itself towards greater conceptual realms, reflecting on what we, as humans, can learn from water. 'Colomboscope' was on view at various venues in Colombo, Sri Lanka, from 24 until 31 January 2019. We respect your privacy and will send infrequent emails.